I love roadside attractions. I can’t remember the last time I traveled and didn’t stop at one. It seems as though I manage to find them either by seeking them out or by accident. And though my kids protested when we made stops at places like the Cadillac Ranch in Texas or a giant orange in Florida, today, when they travel on their own, they often find their way to the same type of fun and quirky stops that I have been taking them to for years. My son took this photo for me on his recent trip to Atlantic City. National Geographic Kids recently published a book just for people like me, and no, I’m not ashamed to be seen reading a children’s book. 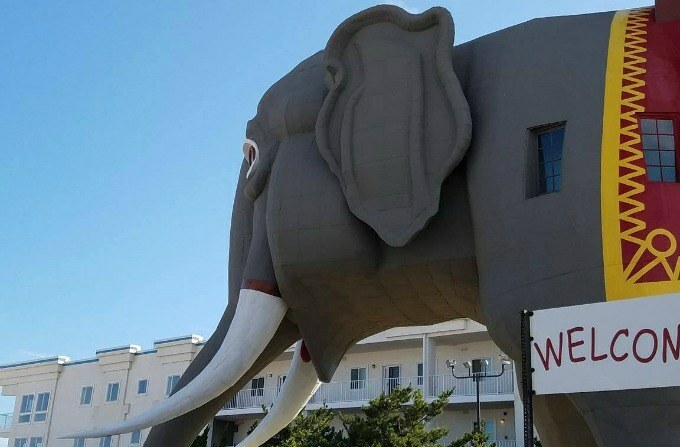 125 Wacky Roadside Attractions isn’t just for kids. This book features fun attractions from around the world. 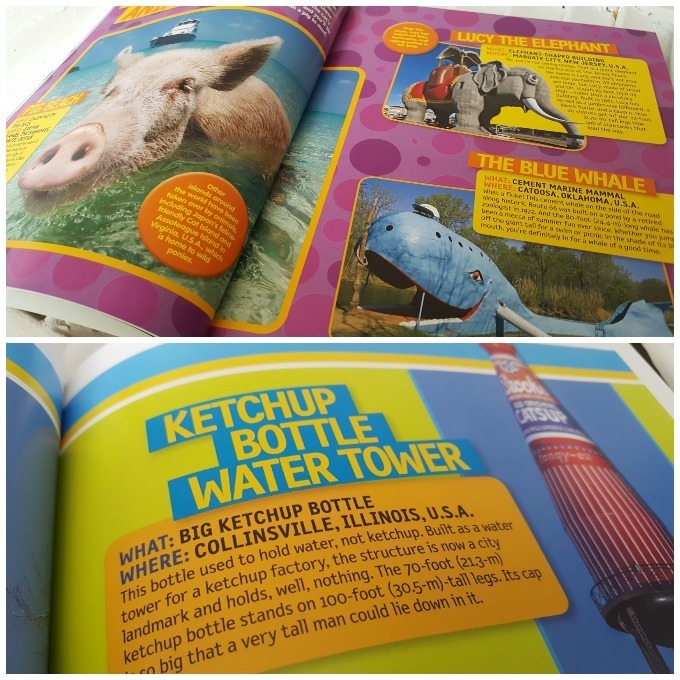 It was fun to glance through and recognize some of the attractions I’ve seen over the years like the Corn Palace in South Dakota or the Ketchup Bottle Water Tower in Illinois. 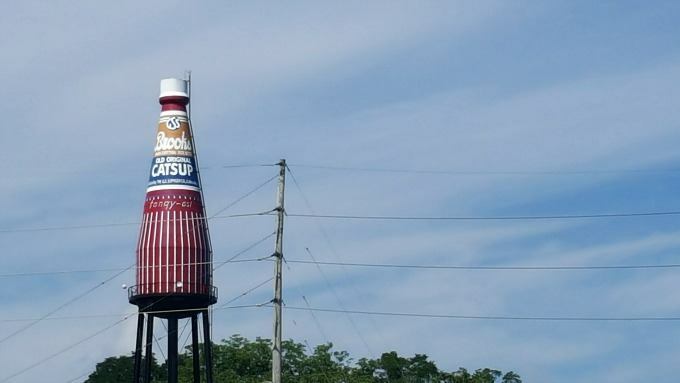 I even found some roadside attractions that I’d like to see on upcoming trips. I think Ben & Jerry’s Flavor Graveyard will be a fun stop when I make it to Vermont. 125 Wacky Roadside Attractions doesn’t stop with roadside attractions. This book also shares fun festivals and activities. Did you know Alaska has an annual Outhouse Race? And Budapest was one of the cities that participated in the International Pillow Fight Day, an event coordinated to encourage people to get off their rears and play? While I love the unusual and quirky roadside exhibits and icons, I’m not overly fond of the Dinner in the Sky event that straps diners to their seats and raises diners about 160 feet into the air for a meal they’re not likely to forget. Loony Lodging- From a chilly arctic resort to a 30-foot tall beagle, these are not your typical accommodations. Brake for Animals- Swim with the pigs in the Bahamas or walk through a giant whale in Oklahoma. These attractions will appeal to the animal lovers in your family. 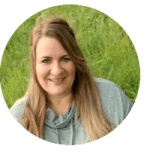 Sidesplitting Shindigs-This section highlights wacky events all over the world that include flower festivals and hot air balloons. Destinations for Dinosaur Devotees- Walk among fossilized dinosaur tracks or step into the shadow of giant dinosaurs. This section will tell you where to find them. Kooky Collections- What do Pez heads, salt and pepper shakers and canine collars have in common? They were all someone’s private collection now on display. Most Peculiar Places- View goats on the rooftops, a museum of bad art, and a two-story outhouse in and more crazy attractions in this section. Spooky Sites-Quirky coffins, the catacombs and the home of Dracula are a few of the hair raising attractions you’ll find under Spooky Sites. 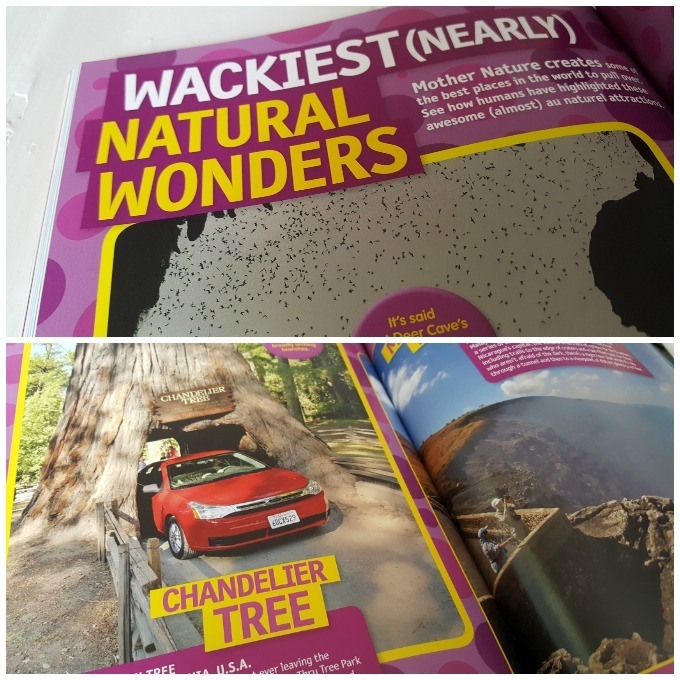 Wackiest (Nearly) Natural Wonders- Did you know there are trees large enough to drive through? Or that you can tour an active volcano? Find out the details of these and more. Radical Replicas- Tour Thames Town in Shanghai or piece of China in San Francisco and find out what other city replicas you’ll find around the world. If you or your child is a fan of the fun, wacky or just plain bizarre, this book is for you. You’ll find great photos, short blurbs about each attraction or event, a road map that lists where the attractions are, and an easy to use index so you can find what you’re looking for. 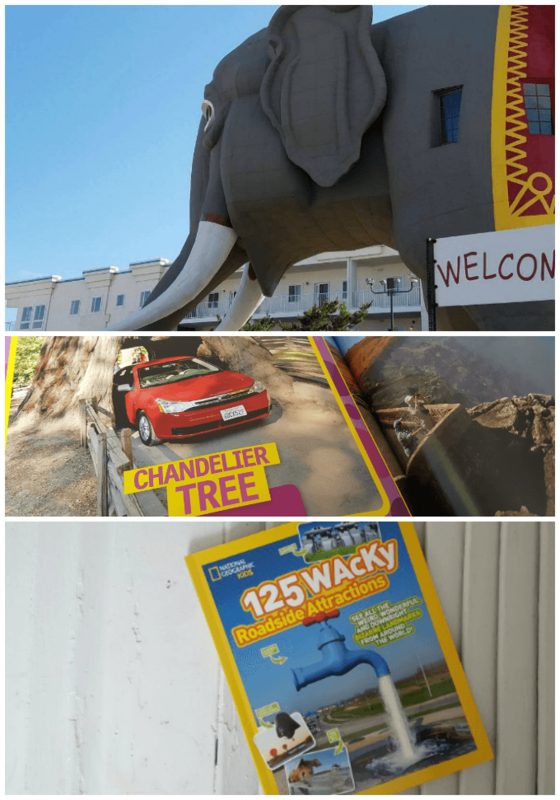 125 Wacky Roadside Attractions retails for $12.99 (US) and is available through Amazon or your local retailer. 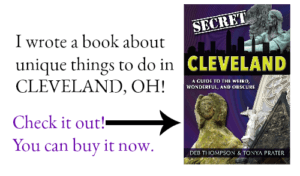 Do you know someone who would enjoy this book? It seems a really interesting book. My son’s birthday is ahead and he loves travelling. I think I’m gonna get this for him. Thanks for sharing! Where I grew up in N.C. there was a kicking machine. It had a handle someone turned that made a the boots move and you stood in front of it. Why, anyone would want to be kicked I am not sure. It didn’t hurt but we always got a laugh out of it. Oh, I’d love to win a copy!! My husband and I plan to buy a travel trailer when we retire in about 4 years and continue travelling in it. We’ve seen many places in the USA, but want to really visit some of the more unusual places along the routes to our destinations. The one thing we are definitely going to do is travel the entire Route 66!!! We want to see the Teepee Motel and many of the quirky, unique sites!